Martha Rose of Rose Construction says Built Green homes, such the ones her company is building in Seattle's Rainier Vista, eventually will be the standard rather than the exception. Action by appraisers and Realtors could hasten the pace toward acceptance. 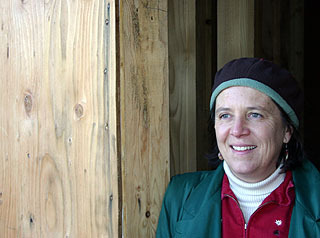 Builder Martha Rose is the queen of green. Some of the homes her Seattle company is building in Seattle's Rainier Vista are pre-wired for photo-voltaic panels. Some have passive solar atriums and heat recovery ventilators, which help keep heating and cooling costs low. And the next houses she'll build will have cisterns for rainwater harvesting. These expensive features add to the cost of a residence, and in the home-building business a ballooning bottom line often can be a deal-killer even though energy-efficient, eco-friendly homes will  in the long run  save buyers money and add to the occupants' health and quality of life. "I'm seeing a lot of interest in the concept  and resistance to buying it," says Rose. Even so more contractors are changing their mind set and jumping on the green bandwagon. But for the change to come full circle appraisers and Realtors need to alter the way they do their jobs, too, says Rose. It frustrates her, for instance, that appraisers do not take into account energy efficiency and other green features when calculating the values of homes. And some Realtors fail to emphasize green features when marketing homes. "That's the weak link in this whole equation," Rose says. She adds that some of the builders she competes against talk a good game when it comes to green building. But when it comes time to actually deciding, say, whether to use more expensive, non-toxic building materials or going the traditional, more economical route they'll choose cheap every time. "I think most of the builders think I'm nuts," says Rose, who talks about how research and green-marketing efforts further add to the cost of a home. "I have to say I don't believe I have been compensated for the cost." But she keeps doing it because she is convinced it's the right thing to do. It was that sort of thinking that led Rose to the building trades. In the 1970s and 80s, Rose saw first hand the shoddy work of some contractors. She was appalled by the practices of particular developers. The thought of being one of them would turn the stomachs of most critics. Not Rose. She recalled the advice of a mentor. He said if you don't like the way a group is doing something, join that group. "I became a developer because I hated what developers were doing," says Rose, whose long-held interest in conservation led her to become one of the pre-eminent, small-scale builders of green housing in Seattle. Ultimately, she thinks her style of building will become the standard rather than exception. But she knows it's going to take a long time  even in the Emerald City. In 2004, more than 14,000 green homes were constructed nationally using green program guidelines. Built Green of King and Snohomish counties certified 1,652 of those homes. That's more than 10 percent of the national market, according the program the local Master Builders Association that runs the Built Green program with King and Snohomish counties. The program has grown from four member builders in 2000 to 250 today. Of those, 96 are builders. The 2005 Green Homes Tour sold out with two bus loads of industry professionals. And the 2005 Built Green Conference had 50 exhibitors and more than 220 attendees. Those numbers impress but another fact  only 14 percent of the new homes built in King and Snohomish counties last year were certified Built Green  shows just how the concept has to go before it's mainstream. It's comes down to cost. Rose says too many builders think there's no reason to go green because you don't make as much money. This is where appraisers come in. "Let's say I sell a house that is Built Green and Energy Star rated," Rose says. Because of those features, the home is worth more. But appraisers are oblivious to the sustainable character of a Built Green home and look at only location and size. "Value does not equal square footage. Value equals something else," says Rose. She thinks this method of appraising properties is why some competitors are resistant to green building. Thanks to the way properties are appraised, they can get a higher price without using sustainable building techniques. "Yes, the public is interested in green," Rose says. "But what is the incentive for the competition to build that way?" Rose also wants to see multiple listing services differentiate between green and traditional homes. They could start by providing a check box for Built Green and Energy Star, she says. This would make it easier for appraisers to take the different into account. Some Realtors do recognize the value of sustainable features, but not many. The Northwest Multiple Listing Service does not have a distinct field on its list forms for Built Green or Energy Star homes. Agents can, however, note a home is Built Green in a comments and remarks section. But a quick search of the MLS database for King County uncovered only nine listings where an agent noted he or she was selling a Built Green or Energy Star home. A listing service spokesperson says the group may add Energy Star and Built Green check boxes if members request them. "On a gut level people want (green) homes," says Rose, who compares the sustainability movement to organic produce. Ten to 20 years ago, organic fruits and vegetable were considered exotic in the marketplace. Now they're considered commonplace. "I think the same thing will be true with housing, and I think (green) will become very mainstream," she says.